FORT WORTH, TX — Former Dallas Cowboys star Charles Haley was the keynote speaker at Monday’s kickoff luncheon for the Lockheed Martin Armed Forces Bowl. The event was held on Monday Dec. 28 at the Fort Worth Omni Hotel. Source: star-telegram.com. The Hall of Famer spoke about staying committed to goals, overcoming issues and the importance of teamwork. He also had some fun at the expense of former Dallas teammate Chad Hennings, who was also at the luncheon. Haley said that the back surgery he had was a result of carrying Hennings to three Super Bowls with the Cowboys. He ended his speech by reminding the guests he was getting paid for the speech and that he’d be at the doors collecting on their way out. Charles Haley is a former defensive end who played for the Dallas Cowboys and San Francisco 49ers from 1986 – 99. He was a 5-time Pro Bowler and 5-time Super Bowl champion. 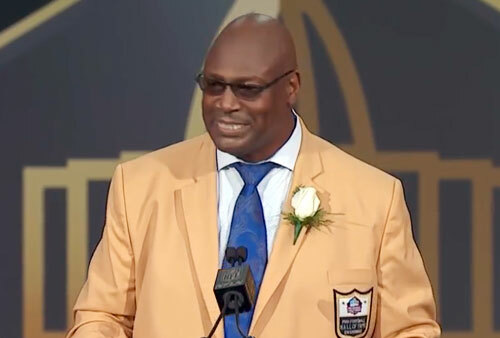 For booking Charles Haley as your next speaker or to contact Charles Haley’s agent for an appearance or endorsement, contact Sports Speakers 360 at 855.303.5450.